There’s a one-word answer to the question of “Why did Christians vote for Trump?” (In a moment, we’ll get to discuss whether they really did all vote that way). ” The American Christians I know who are supporting Trump aren’t doing it for his economic or immigration policies (or his character), but in order to keep Clinton from appointing liberal judges to SCOTUS [Supreme Court of the United States],” Morling College’s Mike Frost tells Eternity. Abortion was legalised across the US by the Row v Wade case in 1973. Cultural conservatives, and Christians in particular, have been trying to overturn it since then. The composition of the nine-member Supreme Court is the key factor, and Supreme Court justices are nominated by the President and confirmed by a vote of the Senate. Donald Trump secured endorsements from conservative Christians leaders by promising to appoint pro-life judges. He clinched even greater support by following up with a list of 21 candidates for appointment to the court. According to conservative news site Townhall.com, pro-life group ‘Susan B. Anthony List’ led a grassroots effort to get Trump elected. They knocked on more than 1.1 million doors in battleground states such as Florida, North Carolina, Ohio, and Missouri during the campaign. After the results came in yesterday, the Republicans retained control of the Senate, and now hold 52 seats in the 100-member chamber. There is one vacancy in the Supreme Court. Trump will get to appoint a conservative or “originalist” justice. “Originalist” means interpreting the Constitution with respect to its original purposes without reading new rights such as abortion or gay marriage into it. Taking this year’s ‘Obergefell’ decision on gay marriage as a guide, that will mean five liberal to four conservative judges. However it is an ageing court, with two senior liberals – Justice Ruth Bader Ginsburg is 83, and Justice Stephen G. Breyer is 78. A second Trump appointment could tip the court into being ‘conservative’ on abortion. The possible judges on Trump’s list are also conservative on gay marriage, according to NYT. The Supreme Court was Trump’s main campaign concession to conservative Christians and it appears to have worked. 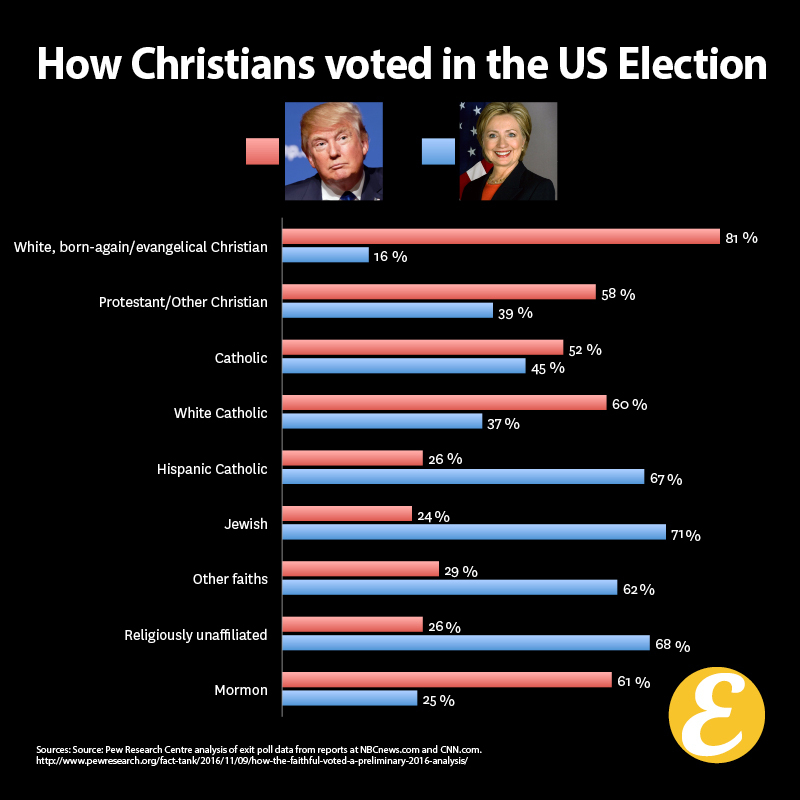 Pew Research’s exit poll analysis – presented in our graphic – shows 81 per cent of “white, born-again/evangelical Christians” voted for Trump. This is 3 per cent more that the republican Mitt Romney got in 2012, and 7 per cent more than John McCain got in 2008. White Catholics also moved towards Trump; he got 60 per cent of their vote with a similar shift since 2008. Hispanic Catholics favoured Hillary Clinton with 67 per cent of their vote (although that had declined compared with their vote for Barack Obama). According to an earlier Pew Research survey, Hispanic Evangelicals supported Clinton 47 to 34 per cent. 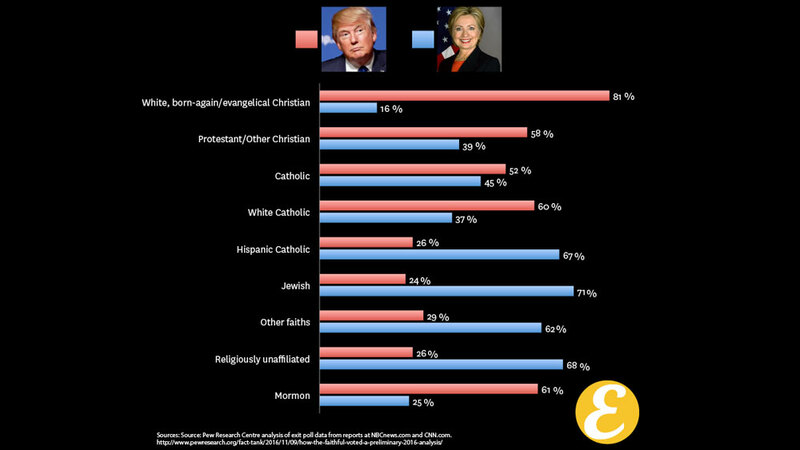 In another pre-poll survey, Lifeway Research found that Evangelical African/Hispanic/Asian American voters were swaying towards Clinton, 62 per cent, with only 15 per cent planning to vote for Trump (according to a report on Christianity Today). The Australian Christian Lobby’s Lyle Shelton believes there are parallels for Australia. 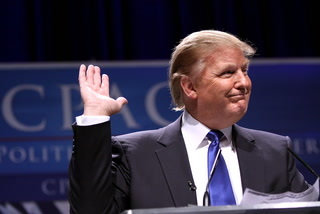 “Donald Trump’s surprise win is further evidence of a growing global backlash against a political class which is increasingly disconnected from the concerns of ordinary people’” the ACL says. “Australian Christian Lobby Managing Director Lyle Shelton said what was playing out in the USA today and witnessed in the United Kingdom’s Brexit vote was also a wake-up call for Australian political leaders. 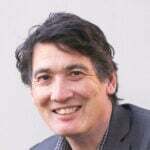 “Australia is not immune from this world-wide trend, as evidenced by the return of One Nation and the continued rise of independents,’ Mr Shelton says.